Snow was falling. Althir-Ka ran. No ordered retreat, no firing-on-the-move fall-back. This was flight, with fear-bile welling in the throat. The dark and the snow and the fear narrowed Althir-Ka’s vision into a tunnel, winding onward between the trees. Somewhere he could hear the crude roar of Mon-Keigh firearms. His reflexes blunted by exhaustion, Althir-Ka tripped over a fallen branch, rolled, and couldn’t get up. 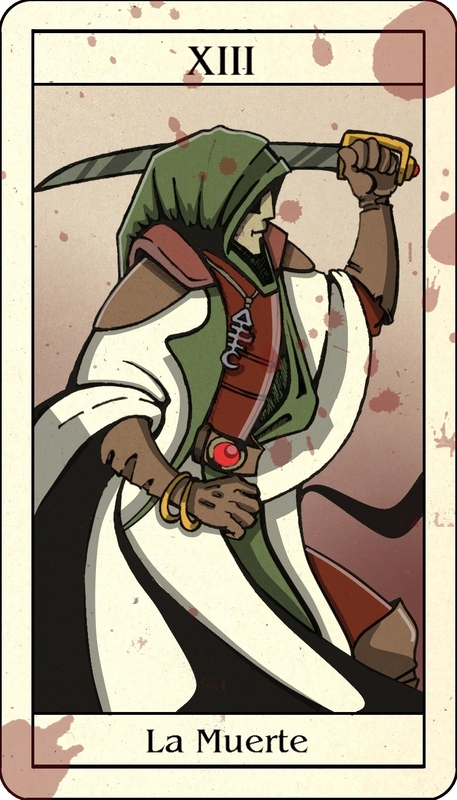 Reasserting control over his panic, he pulled the chameleonic cloak around himself. Was he hurt? No. Just the fatigue draining his muscles. Was he in danger? No. The suit would keep him warm and the cloak would keep him hidden. What had happened? First the rank smell of sweat, then the bellows of the Ogryns. Somehow, they had flanked the Pathfinders’ position, just minutes after the human Colonel had died with a toxic sliver lodged in his heart. The stinking mutant Mon-Keigh had come crashing through the ruined building, the lead brute smashing Aliandras helmet open with a backhand blow. The memory struck Althir-Ka like a lightning bolt. Aliandra had cried out and fallen. The Ogryns trampled her. Her body stomped to nothingness. That’s when Althir-Ka had started running and stopped remembering. He forced himself into meditation as grief threatened to overwhelm him. Fight the feelings, his logical mind told him. Fight the grief and the cold and the snow and avenge her. Althir-Ka stood up on trembling legs, shaking the snow from his cloak. Hatred warmed his limbs as he checked the ammo counter on his needle rifle. His vision was a tunnel with a single goal before him. Vengeance. This is the story I promised James I’d write, oh so long ago. Time flies but here it is! 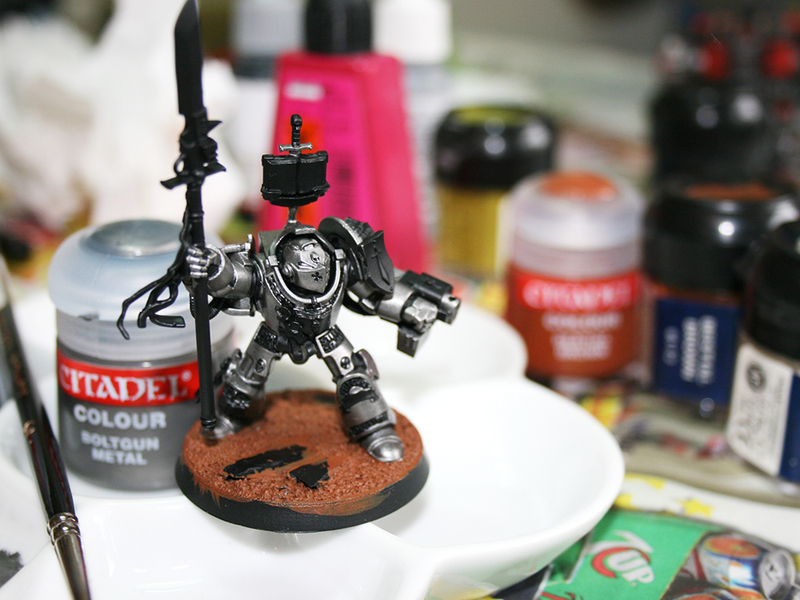 Check out this Grey Knight Termie! You lot! I’ve handled the new sprues. If you like, you can kneel before me now. Here are a bunch of resin bases I ordered from Voodooworx. It’s a small company, set up by super-mega-painter-extraordinaire Wil Davies. At the time of writing, he’s got these 25 mm bases and an assortment of resin plinths for sale. The complete set of 10 cost me £6, plus a small shipping fee. Fairly reasonable, I think. I’ve never tried resin bases before, since they generally look like crap (enormous bases is most likely an upcoming subject for You’re Wrong). These – billed as Alien Temple – are instead nicely understated and have incredibly crisp detail. 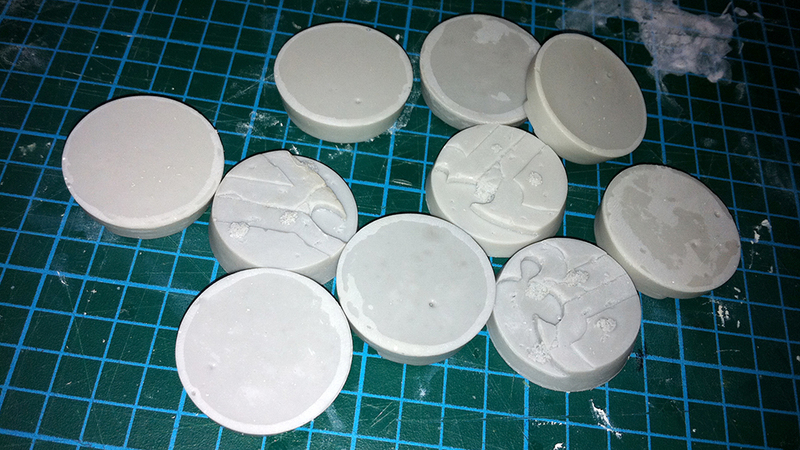 The image above shows the bases after I washed off the mold release with some heavy-duty detergent. The size and bevel fit in nicely with GWs own bases, though the paving adds a fair bit of height as you can see. I like the stepped effect it gives, and the flowing lines of the architecture will complement any Eldar Miniatures you’ll put on them. I sanded the undersides slightly to ensure they were perfectly smooth. There are a few air bubbles in the cast, but nothing that’ll bother me. None of the details seem to have warped either – something I’m used to from Forgeworld miniatures. As a complete aside, why aren’t there any manufacturers offering weighted resin bases? To me if would seem like a perfect way to add stability to just drop in a few lead bits in each base while it’s hardening. Feel free to steal the idea. To really test them I glued on these Wyches that I had laying around. With only a few square millimetres of contact surface, they still stick without pinning. 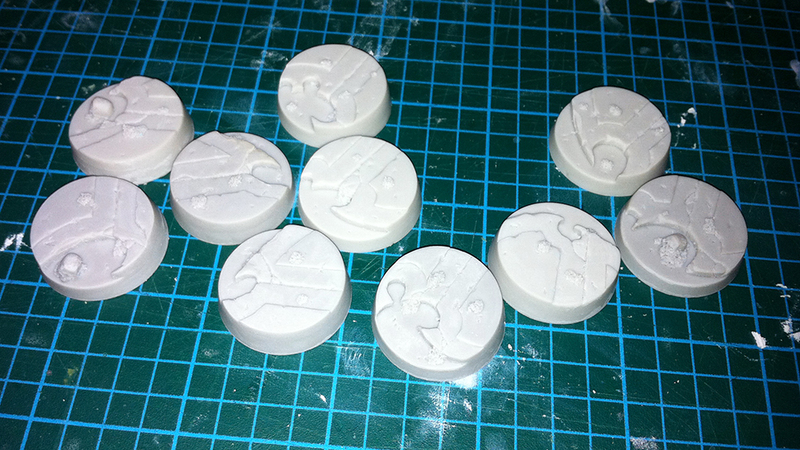 The bases will easily take miniatures with larger footprints as well. The surface is fairly flat in spite of the layered effect – the top layers are very thin. I’m quite impressed by the Voodooworx bases. I bought them on a whim, but’ll gladly buy more once the range has expanded. Compared to getting bases from American manufacturers shipped to Sweden, they’re cheap, and much better detailed. Thumbs up! 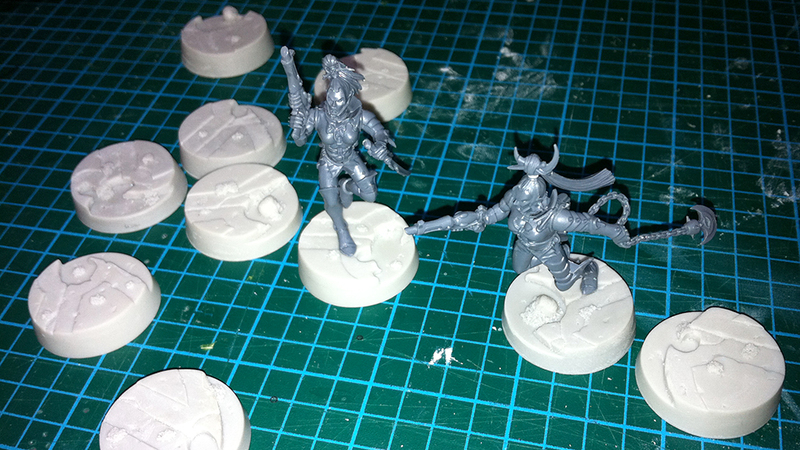 What is it with me and my pathological need to cut the legs of all minis I see? Tyranids are not insects. There. This post should be over by now. Unfortunately the Internet is so full of stupidity that I’m going to have to explain myself. That, and I like the sound of my own typing. 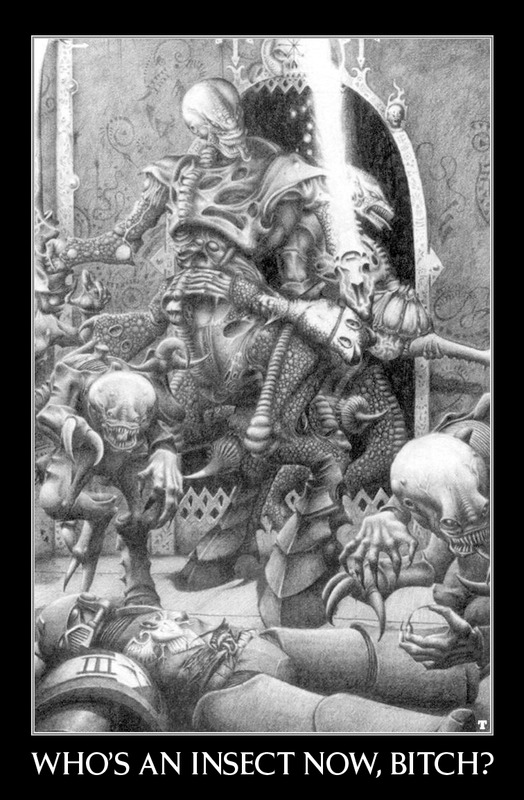 True, Tyranids have an exoskeleton and (generally) six legs. Tyranids also live in swarms, and have a “hive conciousness”. There are other similarities between insects and Tyranids. All of this is purely circumstantial. Not all insects live in hives (far from it, in fact), and those that do certainly have no “overmind” to guide them. The hive is a result of thousands of individual instincts that strive towards a common goal. The Tyranid Hivemind is in essence a god; a warp power; a soul that can actively guide the behaviour of the very creatures that are its source of power. I’ve never heard of any insect that does that. Of course, it is highly likely (by that I mean a certainty) that the feeling the Tyranids were meant to invoke was inspired by the “insectoid” aliens in Starship Troopers and Ender’s Game. There’s also a movie called Alien that you might not be old enough to watch, but I promise you it’s good. It has a non-insectoid monster awfully like a Genestealer. Also, the dinosaurs I mentioned above. To sum up, Tyranids are not insects. They’re bloody Tyranids. I realized that the only things that were bugging me were the long legs and the fact that the pilot is wearing a diaper (how the frack did you think that termies went to the potty anyway?). That was easily fixed by shortening the legs by one joint and putting a loincloth in front of the diaper! I’m honestly really happy with the result, which annoys me since my IRL dito won’t look even nearly as good. Crap. Finally, the wait is over. By now, I bet you’ve all seen the advance orders. Jonathan has already pre-ordered enough for a playable force. 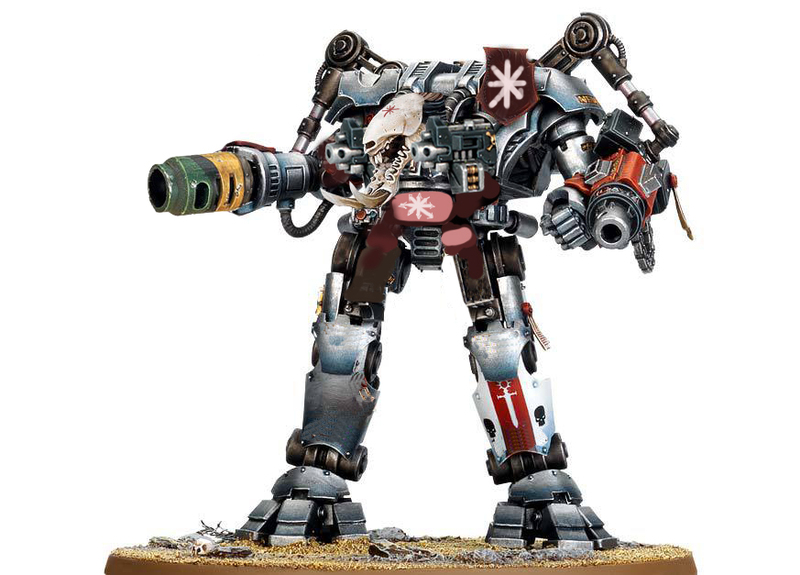 I bet he sat there constantly refreshing GW.com until the Grey Knights came up, the incurable fanboy. All of the Terminator and Power armoured GKs look great, as expected. Tons of pieces – I like the leather hooded heads especially. 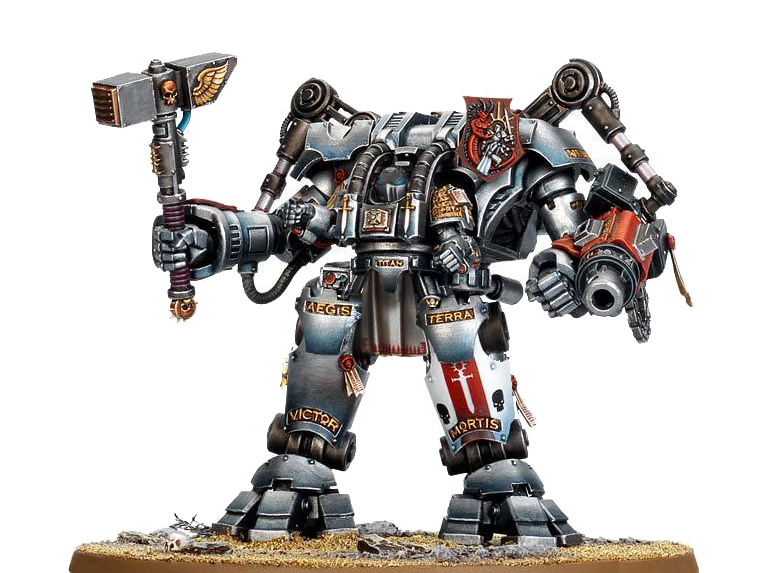 But today, I want to talk about the Dreadknight. It’s silly. While it’s not as manga-riffic as feared it’s still as silly as they come. Silly lore, silly concept, silly miniature. Skarvald the Troll-faced sums it up pretty well: He’s wearing diapers. The humongous sword is taken straight from a 12-year-old anime fan’s wet dreams. 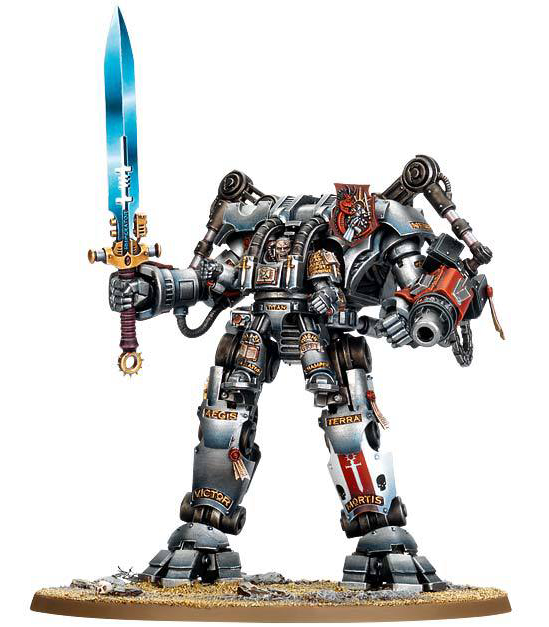 The Dreadknight’s contours are unlike anything we’re used to Imperial industrial designers spitting out. I’d like it it with a more enclosed cockpit instead, maybe even a Dreadnought front and no Terminator legs dangling. Or just skip the pilot, give him a Titan-like head and call him a Daemon Prince. Or better yet a huge arm-cannon and he’s a Defiler. EDIT: Mike from Constantly Risking Obscurity also has a wonderful take on the new models here. Though I think the leather hoods are awesome, his post is incredibly funny.